Gardaí have stepped up border patrols and are working closely with the PSNI following a spate of cross-border crimes. 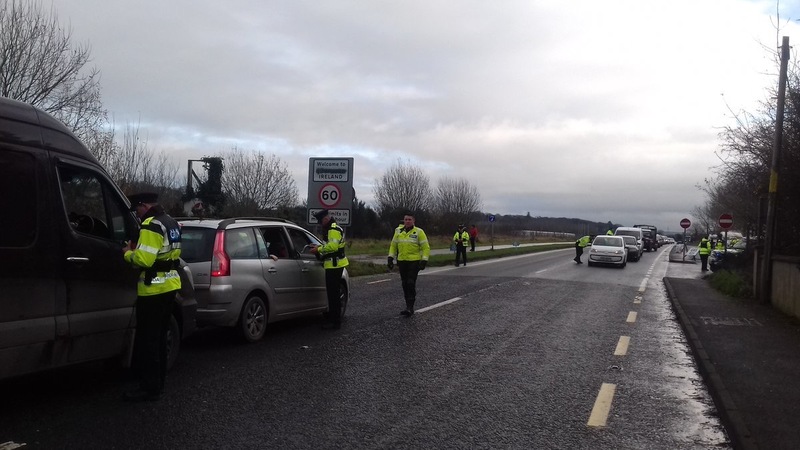 Gardaí and PSNI officers conducting a joint checkpoint at Bridgend as they launch their pre-Christmas anti-drink driving campaign. They have warned local businesses and Christmas shoppers to be extremely vigilant after a spate of thefts in border areas in recent weeks. Superintendent Eugene McGovern said opportunistic criminals are particularly active during the festive period and urged members of the public to be “particularly mindful” in the run-up to Christmas. His warning comes as Gardaí are investigating a number of thefts from local shops and drive-offs from filling stations in Muff, Bridgend, Burnfoot and Fahan. “Businesses tend to be much busier at this time of year and will usually have more money on the premises, making them a target for criminals. I would urge business people to ensure that they follow all the correct protocols for lodging money into the bank and to be extra vigilant for shoplifters,” he said. “People out Christmas shopping should ensure that they put all high-price items locked away in the boot and out of sight. You never know when you may be a target, particularly during the festive season, so don’t make it easy for them,” he urged. Supt McGovern revealed that Gardaí are quite confident that a gang “coming across the border” is responsible for the recent run of crimes here. He said Gardaí have this week stepped up patrols in border areas and are working closely with the PSNI in Derry in a bid to apprehend the criminals.